Yoder Smokers Community Forum • View topic - Am I getting in over my head? So, let me start out by saying I am a complete newbie to the world of Pellet Smokers. I’ve used gas and charcoal both over the years. I’m in the market for a new grill/smoker and I was turned on to Yoder from a visit to a local dealer and these things are beautiful and I have no doubt that it will last me a long time if I proceed with the purchase. On one hand, I want to just make the investment and know I’ll use it for years and years to come. On the other hand, do I start with something “lesser” to get my hands dirty and then in a few years make the jump to Yoder? Just curious if there were others out there in the same boat, what did you go with, etc. Re: Am I getting in over my head? Update: I’m picking my YS640 tomorrow. If anything, you have just made your life easier. You actually have found yourself in the same boat as many of us had been. I too had tried the gas, charcoal and even an entry level pellet grill before stepping up to the Yoder YS640 w/comp cart. 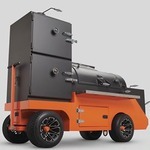 Other than the purests that cannot conceive of anyone would want to do anything other than a wood fired smoker, will not get a lot of complaints from yoder pellet smokers. I now have had my pit for 3 1/2 years. The learning curve is short as long as you do not try to out-think the pit and the quality is very good for the amount of work needed...if you want to call it work. There are a few short comings but some of them are subjective. You will not regret the purchase. If anything it has raised your game and you will become a little more of a perfectionist looking for and longing for the ultimate cook. Love my new YS 640 with comp cart. Big bad machine that gets it done and done right every time.